Ever come across a product on the market and wonder, "What the hell?!" So have we. And today we have compiled 11 of the most head-scratching cat related products out there. If you're looking for a gag gift (or really want your cat to feel included when you're eating a Turducken), then this list is for you! Read on in wonder! Beverly Hills Caviar, in addition to selling fine gourmet products for human consumption, also sells caviar for cats in case you want to spoil your cat for its birthday or something. The website boasts that it is: "concentrated," "easy to serve," and "great for cat parties." At only $27.10 for a 4 ounce can, you can surely splurge for your favorite feline and a few of his closest friends! You've got the pest, We've got the Pee - Let's set up the "Pee-rimeter"
In all fairness, this website is probably extremely useful for land owners, as many of the pees they sell are used to keep out unwanted guests such as rodents, deer, and other unwanted pests. Just sprinkle a little around the "pee-rimeter" and quit your worryin'! Dying cat lover's "cat smell series" 2nd! Reproduction of fabric spray Introducing the scent of cat forehead. I've Incense tone were many of the opinions in customer surveys the "freshly baked bread aroma of" the base. Once buried my face is sprayed with the zing to the futon and cushions, please ended up full blast Suha Ano aroma of fascination. At The Main Lion, a full service cat grooming salon, you can schedule a wash & (hand) dry, nail trim, ear cleaning, and special hairstyles for your cat! The "Lion Cut" package even comes with a free cat toy. Their specialized staff can do pretty much any cat-style you can dream up. 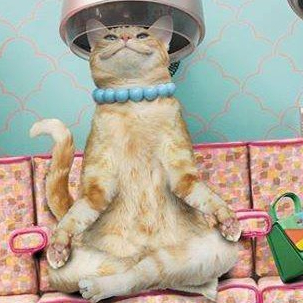 Cats need pampering too, don't they? Going out to dinner? Leaving for work? Keep Fluffy distracted and curious with footage of birds, butterflies, chipmunks, fish and more, complete with sound. ... Because cleaning the litterbox is like, super fun?! Barbie shows just how much she loves her kitten, Blissa, by force feeding it water in a bottle and then squeezing her to make her pee. After that, she cleans the litterbox with cheer and delight! They also make a Barbie pooping dog for the dog lovers in your life! Is your cat feeling left out that it didn't get to partake in the Turducken trend this year? Fear not, you can buy a can of the stuff made specifically for cats! In addition to deciphering what your cat's saying to you, this device can actually analyze your kitty's face and tell you what mood he/she is in. Although it's available in 3 different colors, the language is only available in Japanese. Womp womp. Neuticles allows pets to retain their natural look, self esteem and aids the pet's owner with the trauma associated with altering. I'm no pet psychologist, but are these really needed? Do dogs and cats have that many vanity issues? Apparently they do, as Kim Kardashian's dog, Rocky Kardashian, got "Neuticled" in 2013. Made of grape juice, Vitamin C, and catnip (natch), Nyan Nyan Nouveau is the perfect treat for your cat, for those Saturday nights you're at home alone, crafting puppets out of cat hair.